Entertaining doc takes us behind the scenes with people who made the movies. And here's to you, Mrs. Robinson: A Patrick Mate sketch from Harold and Lillian. Harold Michelson was the go-to creator of storyboards – those hand-drawn graphic aids to frame-by-frame visualization for filmmakers – during the late period of the Hollywood studio system. His ability to “see what the camera would see” made him a favorite craftsperson of Alfred Hitchcock, among many other directors. His wife Lillian Michelson owned and operated her own research library for motion picture production, making sure the details were accurate for everything from settings to costumes to props. Together or individually, they worked on such prestigious movies as Spartacus, The Birds, Marnie, Arthur Ripley’s original Cape Fear, The Graduate, Raging Bull, Fiddler on the Roof, John Frankenheimer's The Manchurian Candidate, Cleopatra, and Manhattan. Yet as Daniel Raim’s engaging documentary Harold and Lillian: A Hollywood Love Story would have it, the Michelsons’ professional careers aren’t necessarily the reason why Danny DeVito (the doc’s executive producer), Francis Ford Coppola, Mel Brooks, and a carload of Tinseltown production designers contribute talking-head testimony. According to them the Michelsons were two of the nicest people in the movie biz. From their arrival in Los Angeles in 1947 until Harold’s death in 2007, they were so conspicuously in love with each other that they became showbiz legends – especially for a business in which partnerships tend to wilt like cut tulips in the sun. But it’s movie-biz insider stuff that sells tickets, and filmmaker Raim has it. Like the time a Latin American drug lord offered to pay Lillian’s way to Bolivia to help her do research for Brian De Palma’s Scarface (Harold nixed the trip). Or about the prostitutes who visited the Bodega Bay location of The Birds. Or Lillian’s first impression of Tom Waits (“Everything that came out of his mouth sounded like a police confession”). Harold’s storyboard image of Anne Bancroft’s legs for The Graduate was adopted into the movie’s publicity and helped make it a hit. Fans of Shrek will remember the characters of the King and Queen – they were modeled on the Michelsons. 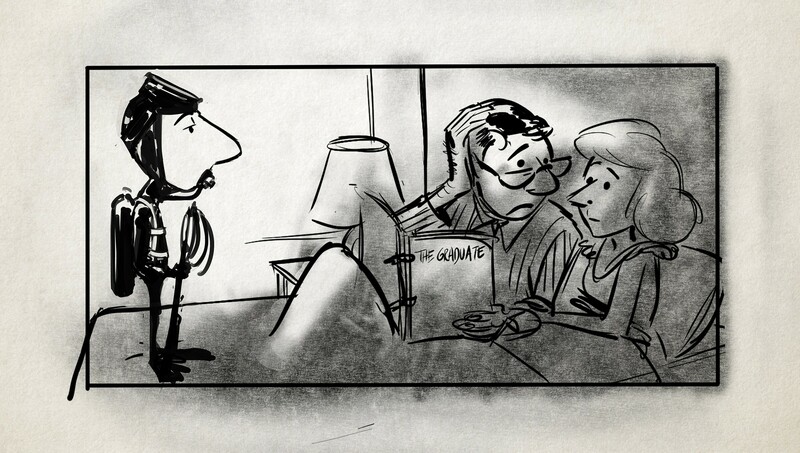 Harold Michelson’s sketches and cartoons are on full display, too, as are artist Patrick Mate’s storyboard-style graphics that comment on the couple’s history. Very few crafts technicians rate their own documentary biographies. Harold and Lillian deserve it. A Ghost Story: Sheet Out of Lu… What Happened at Dunkirk?